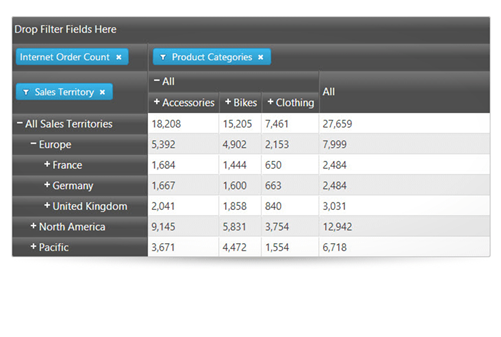 The igPivotGrid control is a data presentation control for displaying data in a pivot table. It enables users to perform complex analysis on the supplied data. The igPivotGrid uses the Online Analytical Processing (OLAP) approach to present the results of multi-dimensional queries in an easy to comprehend manner. The igPivotGrid control uses an instance of either igOlapFlatDataSource™ or igOlapXmlaDataSource™ component as data source. Enables sorting of the header cells in columns. Enables sorting of the header cells in rows. Enables sorting of the value cells in columns. The indentation for every level column when the compactColumnHeaders is set to true. A boolean value indicating wheter the column headers should be arranged for compact header layout – each hieararchy is in a single row. The indentation for every level row when the compactRowHeaders is set to true. A boolean value indicating wheter the row headers should be arranged for compact header layout – each hieararchy is in a single column. A function that will be called to determine if an item can be moved in or dropped on an area of the pivot grid. Type="number" Specifies the width of the row headers. Setting deferUpdate to true will not apply changes to the data source until the updateGrid method is called. Settings for the drag and drop functionality of the igPivotGrid. Specifies the containment for the drag helper. The area inside of which the . Specifies the default sort direction for the levels if no sort direction is specified in an item from the levelSortDirections option. Specifies the default sort direction for the rows. Options specific to the igGrid that will render the pivot grid view. Enables/disables rendering of alternating row styles (odd and even rows receive different styling). Note that if a custom jQuery template is set, this has no effect and CSS for the row should be adjusted manually in the template contents. Caption text that will be shown above the pivot grid header. Default column width that will be set for all columns. The default column width can be set in pixels (px). The default column width can be set as a number. Enables/disables rendering of ui-state-hover classes when the mouse is over a record. This can be useful in templating scenarios, for example, where we don't want to apply hover styling to templated content. A list of grid features definitions. The supported features are Resizing and Tooltips. Each feature goes with its separate options that are documented for the feature accordingly. Headers will be fixed if this option is set to true, and only the grid data will be scrollable. Initial tabIndex attribute that will be set on the container element. This is the total height of the grid. Hide the columns drop area. Hide the filters drop area. Hide the measures drop area. Hide the rows drop area. A boolean value indicating whether a parent in the columns is in front of its children. If set to true, the query set sorts members in a level in their natural order - child members immediately follow their parent members. A boolean value indicating whether a parent in the rows is in front of its children. An array of level sort direction items, which predefine the sorted header cells. Specifies the unique name of the level, which will be sorted. Specifies the sort direction. If no direction is specified,. Will stretch to fit the data, if no other widths are defined. Use ui.owner to get a reference to the pivot grid. Fired before the filter members drop down closes. Fired after the OK button in the filter members drop down is clicked. Fired before the filter members drop down opens. Use ui.rootFilterMembers for a collection with the root filter members. Fired after the sorting of the headers. Use ui.levelSortDirections to get an array of the level names and sort directions that were used. Use ui.appliedLevelSortDirections to get an array of the level names and sort directions that were actually applied to the table view. Fired before the sorting of the headers. Use ui.levelSortDirections to get an array of the level names and sort directions that will be used. Fired before a metadata item drop. Use ui.draggedElement for a reference to the metadata item element. Fired before a metadata item is removed when the user clicks the close icon. Event fired after the headers have been rendered. Use ui.grid to get a reference to the igGrid widget, which holds the headers. Use ui.table to get a reference to the headers table DOM element. Event fired after the whole grid widget has been rendered (including headers, footers, etc.). Use ui.grid to get reference to the igGrid widget, which represents the data. Fired after the sorting of the columns. Use ui.sortDirections to get an array of the tuple indices and sort directions that were passed to the table view. Use ui.appliedSortDirections to get an array of the tuple indices and sort directions that were actually applied to the table view. Fired before the sorting of the columns. Use ui.sortDirections to get an array of the tuple indices and sort directions that will be used. Fired after the collapse of the tuple member. Use ui.axisName to get the name of axis, which holds the member and the tuple. Use ui.memberIndex to get the index of the member in the axis. Use ui.tupleIndex to get the index of the tuple in the member. Fired before the collapse of the tuple member. Fired after the expand of the tuple member. Fired before the expand of the tuple member. Returns an array with the applied sort directions on the igPivotGrid's columns. The returned array contains objects with the following properties:<br/>tupleIndex: The index of the tuple on the column axis in the original unsorted result.<br/>sortDirection: The direction of the sort - ascending or descending. tupleIndex: The index of the tuple on the column axis in the original unsorted result. sortDirection: The direction of the sort - ascending or descending. Returns an array with the applied level sort direction items, which were used for the sorting of the header cells. The returned array contains objects with the following properties:<br/>levelUniqueName: Specifies the unique name of the level, which was sorted.<br/>sortDirection: The direction of the header sort - ascending or descending. levelUniqueName: Specifies the unique name of the level, which was sorted. sortDirection: The direction of the header sort - ascending or descending. Collapses a member from the data source and returns true if the collapse succeeds. If the data source has a pending update, the method will return false. Note that igPivotGrid to will display the expanded result after the data source is updated. The name of the parent axis - 'columnAxis' or 'rowAxis'. The index of the containing tuple. This index should correspond to the position of the tuple in the original unsorted result of the data source. The index of the member in the tuple. This index should correspond to the position of the member in the original unsorted result of the data source. A flag indicating whether the data source should be updated after the expand. Expands a member from the data source and returns true if the expand succeeds. If the data source has a pending update, the method will return false. Note that igPivotGrid to will display the expanded result after the data source is updated. Returns the igGrid instance used to render the OLAP data. Triggers an update on the data source and the igPivotGrid. Classes applied to the overlay, which shows when the pivot grid is loading. Classes applied to the elements, which collapse the pivot headers. Class applied to the drop areas. Classes applied to the drop area headers. Classes applied to the valid drop element. Classes applied to the elements, which expand the pivot headers. Class applied to the filters drop down element. Classes applied to the indicator for ascending header sorting in the columns. Classes applied to the indicator for descending header sorting in the columns. Classes applied to the indicator for ascending header sorting in the rows. Classes applied to the indicator for descending header sorting in the rows. Classes applied to the invalid drop element. Class applied to the container of the pivot grid. Classes applied to the indicator for ascending value sorting. Classes applied to the indicator for descending value sorting. Class applied to the scroll buttons added when the hierarchies and the measures overflow the drop area. Classes applied to the scroll left button. Classes applied to the scroll right button.